The 2019 Honda Ridgeline is now making its way towards dealerships in Mid-Michigan, and our friends and neighbors are sure to love this new addition to Honda’s All-Wheel Drive lineup. Unlike many of its competitors, the Honda Ridgeline’s interior features leave little to be desired. Its seats, stereo, and other standard features give it a real edge over more conventional pickups, and we’re not the only ones who think so. The Ridgeline’s 2018 release was named Car and Driver’s Best Mid-Size Pickup in their annual 10Best Trucks and SUVs evaluation, and once you’ve gotten a hands-on feel for its interior, you’ll have no trouble seeing what sets it apart! Just because you drive a pickup doesn’t mean you have settle for second-class interior features! The Ridgeline’s seating capacity is five passengers, and it’s been outfitted with high-end finishing touches that are hard to miss and easy to appreciate. Leather-Trimmed Interior: Leather-trimmed seats and a Leather-Wrapped Steering Wheel both come standard on the RTL trim level and up. On the RTL-E and Black Edition trim levels, the Ridgeline’s steering wheel heats itself to provide a greater degree of comfort on the coldest days. Heated, Power-Adjustable Front Seats: Beginning in the RTL trim level, the Ridgeline offers a Driver’s Seat with 10-Way Power Adjustment and Lumbar Support as well as a Front Passenger Seat with 4-Way Power Adjustment. Heated Front Seats also come standard in this trim level. Interior Configurations: Making the most of the Ridgeline’s spacious interior is easy when you take advantage of its 60/40 Split Lift-Up Rear Seating and its underseat storage compartment. 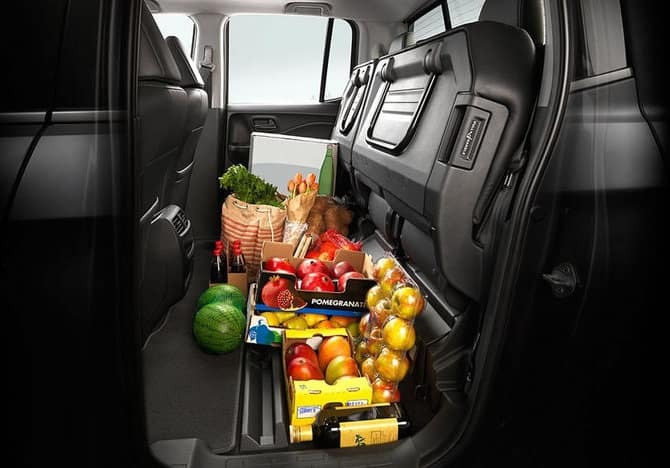 With all seats in their normal upright positions, the Ridgeline offers either 109.7 cu. ft. or 108.7 cu. ft. of passenger space depending on which trim level you choose. Tri-Zone Automatic Climate Control: Drivers and passengers everywhere understand how important it is to be able to travel in a cabin that’s neither too warm nor too cold. The trouble starts when people disagree over what that ideal temperature should be. Thankfully, every Ridgeline trim level beyond the baseline RT comes equipped with a Tri-Zone Automatic Climate Control System. Audio and Connectivity Features That You’ll Love! A comfortable interior isn’t the only thing that distinguishes the Ridgeline from competitors. Here as well, drivers and passengers will encounter an exceptionally wide variety of audio, entertainment, and connectivity features. The Ridgeline’s standard features will make every drive more enjoyable, and they’ll help you stay connected to friends and family when you’re putting in long hours on the road. Honda Ridgeline Stereo: The Ridgeline’s RT, Sport, and RTL trim levels offer a 200-Watt 7-Speaker Audio System, while the RTL-T trim includes a 225-Watt 7-Speaker System instead. Both the RTL-E and Black Edition trim levels include a major upgrade: a 540-Watt Premium 8-Speaker Audio System that lets you enjoy your music as it was meant to be heard. These trims also include a Truck Bed Audio System—the first stereo of its kind. Satellite-Linked Navigation System: Turn-by-turn directions, HD Digital Traffic updates, predictive local search, and voice commands will make every drive more enjoyable. Honda’s Garmin-based Satellite-Linked Navigation System comes standard on the RTL-T, RTL-E, and Black Edition trim levels. Smartphone Integration: Simple connectivity technologies like Bluetooth HandsFreeLink and Bluetooth Streaming Audio come standard in the Ridgeline’s baseline RT trim level, but a greater degree of connectivity becomes possible when you upgrade! A USB/Smartphone Audio Interface, an SMS Text Message Function, and HondaLink have all been included in the Ridgeline’s upper-level trims. 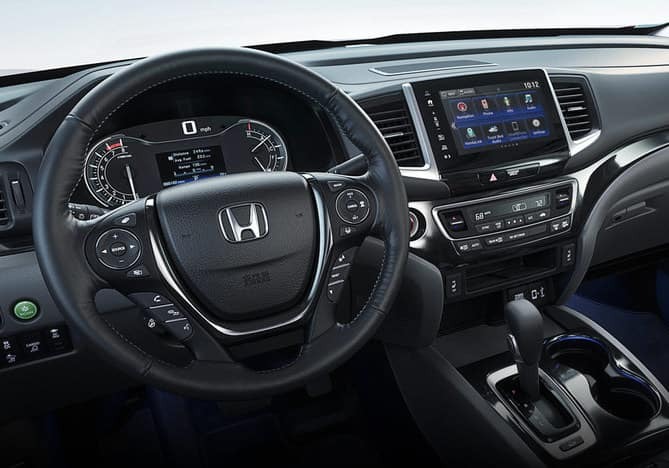 Eight-Inch Display Audio System: With so many entertainment, convenience, and technology features, the Ridgeline’s interior might seem a little intimidating. Still, when you take advantage of this pickup’s available Display Audio Touch Screen, you’ll be able to master them all! This system features customizable button tiles, standard starting on the RTL-T trim level. Sirius XM Radio, Pandora Radio, and HD Radio are all offered here as well. Test Drive the Ridgeline Today! Now’s your chance to get behind the wheel of the2019 Honda Ridgeline! This celebrated pickup is available at dealerships across Mid-Michigan, and when you take advantage of our current offers, you can take home all your favorite features in the Ridgeline trim that most excites you. Reach out to one of our expert representatives to get started.